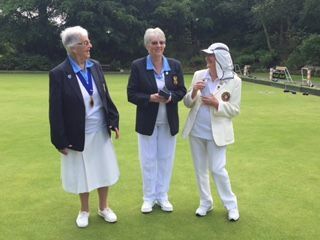 On Thursday June 23rd the Friends visited Harrogate Bowling Club to play our third and final game in Yorkshire. It was a very warm day with not too much sunshine. Perfect bowling weather. 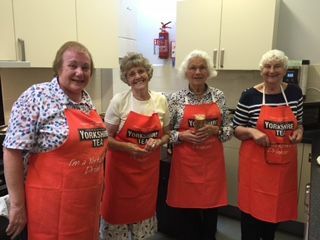 We were warmly greeted with cups of tea on arrival and this was followed by a lovely buffet lunch. We were delighted to be invited to help celebrate the 85th birthday of the club which is set in stunning Valley Gardens. 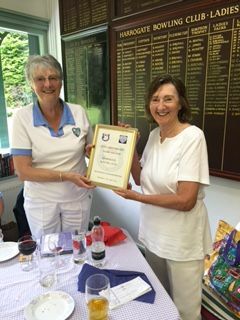 President Muriel Hawley welcomed us to the club as did Sue Wallace, the captain for the day. A most enjoyable game took place with lots of laughter on every rink. Lots of new friends were made and it was good to catch up with old ones. We southerners are used to much faster rinks but over the three games we had obviously built up our muscles as we managed a win for the first time in Yorkshire. 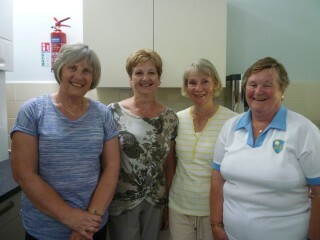 A delicious meal, cooked by Joan, was served, aided by her helpers. Days like this do not just happen and a lot of work and organization goes into them. Cyndy Lee, captain for the day, thanked everyone concerned for such a splendid day. Thanks were also given to Adie and Kath for arranging such a superb mini tour to Yorkshire. Can we do it again next year please.